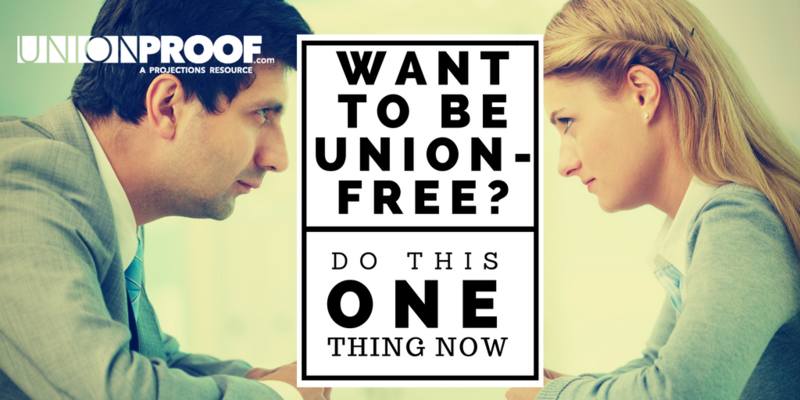 » Want to Be Union Free? Do This Now! Understanding Ethics: Does Employee Age Matter? Want to Be Union Free? Do This Now! Once a labor-relations issue arises, or a campaign to unionize your workplace begins, nothing looks as bad as a quickly re-drawn grievance procedure. At best, you will have weakened your employee’s trust in you; at worst, you might be guilty of an unfair labor practice. Making sure employees feel like they’re a part of things plays a major role in creating a union proof culture. Implementing a pro-worker alternative dispute resolution (ADR) policy now will go a long way towards securing this end. Proper employee communication is vitally important in all aspects of your approach to human resource management. As part of your company’s continuing dialogue, it is crucial to ensure that employees feel they have a voice in the workplace arena, and that this voice is listened to by managerial staff and those in decision-making positions. Even if you’re only just beginning to create your ADR policy, or you have just begun to make substantial changes to a pre-existing one, let your workers know this as soon as possible. Communicate in the way most familiar to your employees, so that while the issue may be new, the mode of communication is trusted. If you do regular video updates and distribute them via an email link, don’t suddenly start using social media to talk about your dispute resolution process – – even if you plan to use that new channel to educate employees on the program going forward. It might seem a trivial point, but do you know what issues in the day-to-day running of your business are the most likely to make your employees concerned? Survey your workforce. Find out if there’s a health and safety issue that they are particularly worried about, and identify any areas that might make your staff feel insecure or anxious. Conducting an employee survey may also help shape your Dispute Resolution policy. You’ll definitely get an idea of the issues that might be addressed by your ADR program, and how engaged your employees might be in that process. Fully integrating your workforce into the actual dispute resolution process itself is a great way to signal to your employees that you are willing to take their input seriously and give them a role in the things that matter to them. Furthermore, employees are often the best-positioned people in your business to tell you about the specifics of an internal workplace dispute. Rather than being overly lenient, they are usually the most incentivized members of your company when it comes to grading their colleague’s work performance. As an employer, you are not going to get every decision right. But appearing arbitrary with the application of your decision-making principles is a surefire way to bring about employee-relation breakdown. A good insurance against this perceived arbitrariness is to have a fair and robust appeals policy. This way, bad decisions can be swiftly rectified, and it provides another outlet for employee grievance other than turning to a union. This should be fairly obvious, yet it does require diligence from your managerial team. Consistency is the visible byproduct of integrity, and employees can spot a lack of integrity from a mile away! Inconsistency, even in the smallest of workplace matters, can have profound implications for workforce morale. Train your managers and supervisors to understand this, and educate them on the need to apply workplace rules fairly across the board. Listen to your employees as you create your ADR process, and take action based on what they are saying. In order to be inspired, employees must feel that they are making a worthwhile contribution to the organization – and that their contribution is valued by you, their employer. With an effective channel to have their voices heard, it won’t be a union they turn to when problems arise. You may find The United States Office of Personnel Management’s guide to creating an Alternative Dispute Resolution process helpful. © Projections, Inc. All Rights Reserved.